His declaration caused enough fear and uncertainty. Some elected assemblymen were named ministers, while others were appointed by Marcos himself. 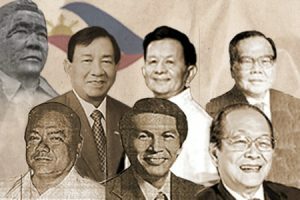 From the start of his term in 1965 up to his ouster in 1986 through a People Power uprising, Marcos worked with 77 Cabinet secretaries and ministers. After People Power, some of these officials remained in the political scene, while others started or continued their business careers. Here are some other facts about the Cabinet members of Marcos. Manuel Collantes † – United Pulp and Paper Company, Inc.
David Consunji – DMCI Holdings, Inc.
Catalino Macaraig, Jr. † – Lepanto Consolidated Mining Co.
Jaime Laya – GMA Network, Philtrust Bank, Ayala Land, Calata Corp.
Estelito Mendoza – Philippine Airlines, PNB, Petron, Meralco, San Miguel Corp.
Teodoro Pena (retired) – RCBC, EEI Corp.
Ed’s note: We earlier stated that Hilarion Henares Jr. was part of the Marcos Cabinet as National Economic Council (NEC) chairman. It was, in fact, Alfonso Calalang. Henares was NEC chairman during the Macapagal administration. We regret the error.